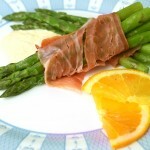 One of the best recipes for asparagus in my opinion. Really delicious, delicate sauce. Cook asparagus quickly and use dry herbs such as oregano, basil, rosemary, tarragon. Wash the asparagus. Heat the butter in a pan and add the asparagus. Cover lightly with water and simmer until tender. 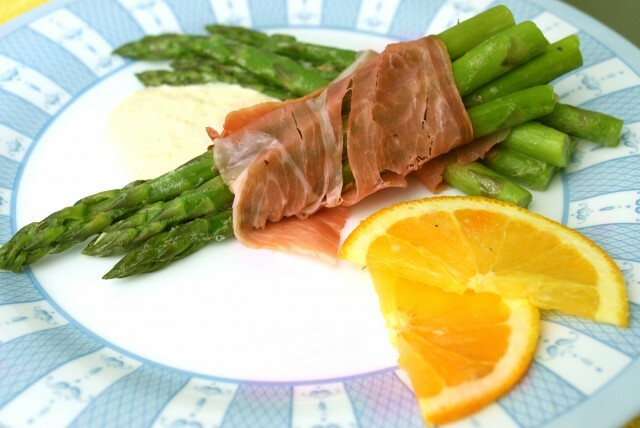 Asparagus can be sprinkled with favorite herbs. For the sauce: put chopped garlic in a mayonnaise, add the orange juice and grated zest, pepper and mix well. 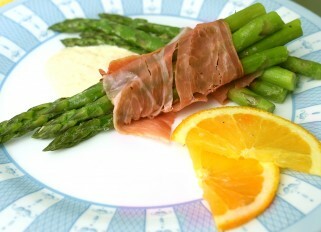 Put the asparagus on a plate, cover with sauce and serve with a slice of orange and a slice of ham.